A couple of weeks ago at Phil’s, we were chatting about Columbia’s block games, comparing those we enjoyed and those, well, not. Phil mentioned he had bought a copy of East Front, Columbia’s WWII block game of Germany’s attack on the Soviet Union, put all the stickers on the blocks, but had not played it. I also mentioned that it had sounded good, but I had not tried it either. At the moment, time was a bit too short to start learning a new game, but I borrowed it to at least read the rules. The rules sounded promising, with a couple of interesting concepts, notably the interaction of HQs, command radius, and air power. Those of you who have read my AARs know that I’ve played a lot of the block games, and while some are brilliant, most tend to revert to WWI materialschlacht with relatively static lines broken only by feats of statistics-breaking die rolls. Reality in the form of two games with fellow gamer Dennis offered glimpses of what might have been. Granted, we only played two introductory games, but for rules as written, you get one shot at blitzkrieg and then pfffft, you pretty much transition into sitzkrieg. Phil’s game was first edition, so Dennis and I searched Columbia’s website to find the second edition rules. Funny thing that — Columbia at some point changed the hex orientation according to the scenario set-up illustrations. In 1st Edition, the flat of the hexsides ran north-south. In 2nd edition, it runs east-west. For a hex game that launches attacks from adjacent hexes, that’s a large change. For East Front, which has combat based on blocks in the same hex, not as much. 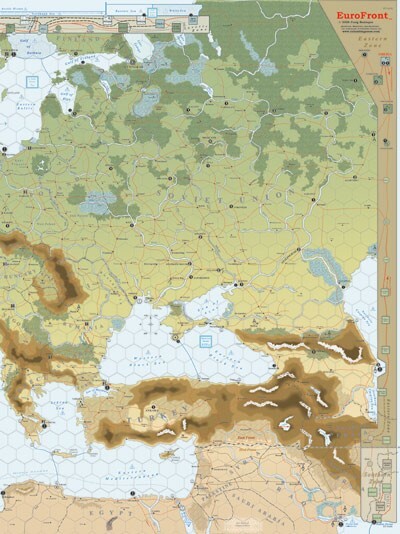 The 2nd edition map covers a larger area (includes Turkey and North Africa) than the 1st edition map we used. The retail price for 2nd Edition is $99.98 and includes 130 wooden blocks (20mm), Labels to stick on the blocks, two maps (each 22.5 x 34 inches), 60 die-cut markers, rules, and four dice. As I noted, we were using the 1st edition game with 2nd edition rules. The blocks represent German corps and Soviet armies with the usual strength points around the edges. Most German blocks have up to four strength points, while most of the Soviet infantry have up to three strength points. We set up the introductory scenario Edelweiss, which deals with the 1942 German attack to grab the oil fields south of Stalingrad. 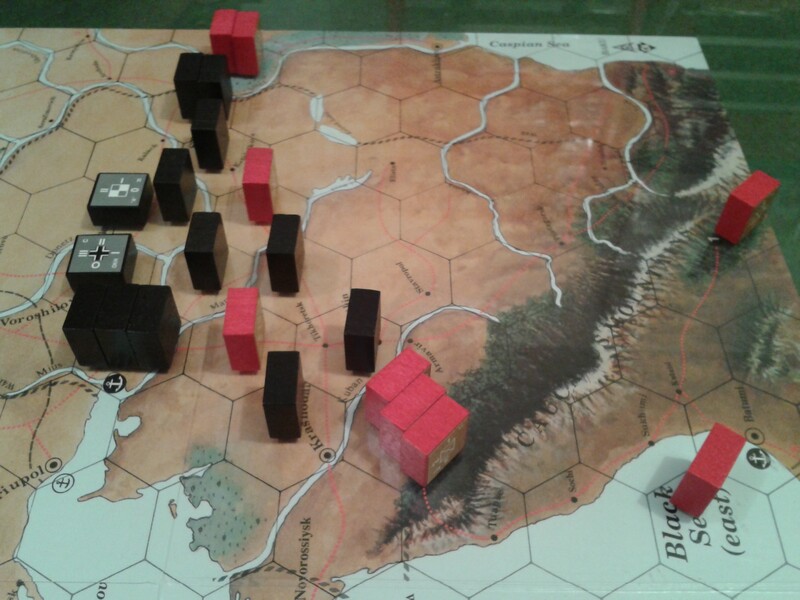 This scenario specifies the set-up hexes and the unit strengths along the seven-hex front and the battlefield is seven hexes deep. About a dozen blocks per side, including the HQs. HQs control the game because you must expend a step to activate units within the command radius of the HQ and gain full effect for combat. If you opt for blitz, essentially allowing another attack and combat, you expend two points. These points represent logistical capabilities. Alas, in our first game, I misread the HQ instructions and thought blitz costs two strengths points in addition to the one initial strength point. HQs also provide air attacks, which take effect before the defender rolls dice. I liked this clever mechanic — even cleverer when you figure that the initial HQ strength point is also the number of air attacks and the range from the HQ where they go. There is no defensive air interception or anti-aircraft as far as we can tell, nor any defensive air attacks. Furthermore, the initial HQ strength point is also the command radius at which blocks can be activated to move and gain full combat strengths. Blocks outside that initial HQ strength point do not move, as far as we can tell, and combats outside the range do so at half effect for the attacker (phasing player). Think about that for a moment. As HQs spend strength points, their command radius decreases and their air attacks lose impact. Yes, it’s a bit of a logic leap that the HQ originally could send the Luftwaffe three hexes away, but now only one hex away, or order blocks three hexes away to move and now only can order adjacent blocks to move. Simplicity trumped realism here. 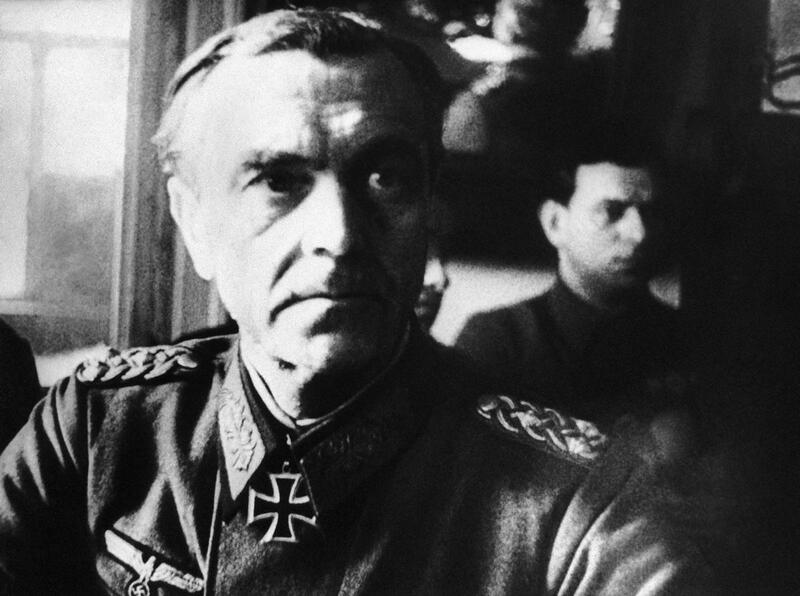 Both sides also have a supreme HQ unit — OKH for the Germans and STAVKA for the Soviets. These allow players to move a number of units equal to twice the strength point rating anywhere on the board, and to allow units to use rail movement (10 hexes). These two supreme HQs cannot be used for blitz movement. In any case, once blocks gain activation, East Front plays similar to other Columbia block game. Maximum four blocks in a clear hex (less in other types of terrain), maximum two blocks per hexside to attack (one in other types of terrain hexsides), and defenders fire before attackers — except for air attacks. A difference is the Double (and Triple) Fire and Double Defense modifiers for units and terrain. All units hit on a 6 (unlike most other block games that varies the to-hit number by unit). However, some units, like armor, have Double Fire, which means they throw the same number of dice, but hit on 5 or 6. 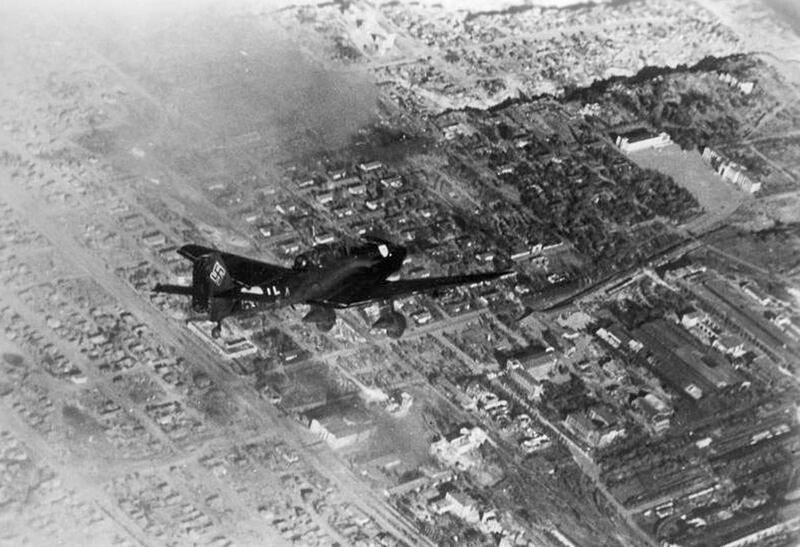 Triple fire – the Luftwaffe in 1941 — means they hit on 4-5-6. Units in some terrain, like cities, gain Double Defense where they take only half a hit instead of a full hit from successful enemy dice. Both differences offer simple and clever mechanics to reflect better capabilities of armor and tougher terrain in defense. Each turn equals two weeks (like Europa). Here’s where East Front starts to sputter a bit. We read the supply rules several times. We think that supply only counts at the end of the other player’s turn. Thus, you can race behind the enemy lines without a supply line to your name on your half of the turn, allowing your zones of control to cut off enemy units even if your units don’t have their own supply line. At the end of your turn, any enemy unit that can’t trace a supply line loses a strength point — even if those friendly units can’t trace a supply line, either. And don’t look for any aerial relief, either. No use of air points to drop supplies to beleaguered corps. 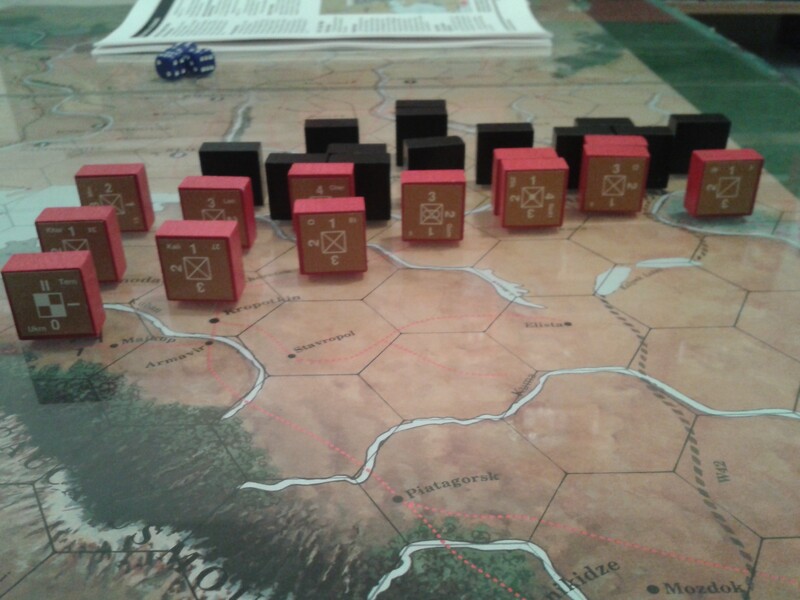 With units deployed, the Germans began their Operation Edelweiss drive to the oil fields…not exactly. First game. End of the first turn. A nice solid Soviet line. They attacked, but got really nowhere in three turns. It’s my fault. As I noted, I read that blitz took two EXTRA strength points. Not true. A regular attack takes one strength point. A blitz attack takes two strength points. Dennis did regular attacks. Then, because the example of play, which used the introductory scenario for instruction, only showed the first three turns (July II, August I and II), we stopped play at the end of August II instead of November II. The Germans basically got nowhere. OK, we’re doing something wrong, because the example of play shows the Germans overrunning everywhere. Well, we two geniuses read the rules a little more to find the correct supply point system, reset, and tried again. Much better. Dennis went for the blitz on the first turn. His first turn regular attacks blew one hole in my line. 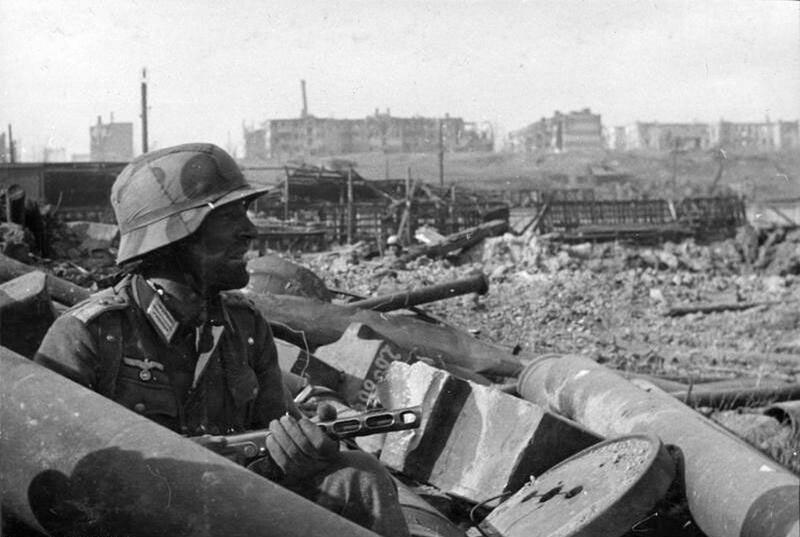 His second turn blitz attacks captured Rostov and Stalingrad, eliminated four infantry blocks, and sent the panzers curling south to the hex outside Maikop. Now, that’s more like it! As we found in other games, Masuria comes to mind, the I-go, I-go, then U-go really helps the offense out. I shuffled units around. Two of my units had been cut off from supply and lost a step. We could not find any rule that prevented out of supply units from moving, so, I moved them back into supply. At the beginning of the month, both sides get a production phase, where you can rebuild units one strength point at a time, or, build entirely new units. For example, Soviet infantry require 2 Production Points (PP) to add a Strength Point (SP) to a unit on the board, but need 4 Production Points (PP) to build a new 1 Strength Point (SP) unit (called a cadre). The Germans need 4 PPs to add 1SP to infantry, but 6 PPs to build a 1 SP cadre. Other units, like armor, cost more, Germans more than Soviets. Second game. End of first turn. Not such a nice Soviet line. Panzers push adjacent to Maikop (defended by three blocks), take Rostov and Stalingrad, and cut off supply to what was left of the Soviet front line. The ‘Black Sea Fleet’ is really the STAVKA HQ. Now you come to HQ points — a whopping 10 PPs to add 1 SP and 20 to build a new 1 SP HQ unit. With the Germans starting with 28 points and the Soviets with 30, you can see that adding SPs to the HQs will burn up PPs. As Rostov and Stalingrad were both worth 1 PP each, the Germans had 30 PPs to spend, the Soviets 28. During the first turn (July II), the Germans used the one HQ they had for the blitz attack, bringing it from its starting (and maximum) 2 SP down to 0 SP, while they used OKH twice for air support and movement, bringing it from 3 SP down to 1 SP. Thus, if the Germans don’t spend PPs for HQ SPs, they will be able to move exactly two units on the August I turn and none on the August II turn. So, the Germans spent 20 PPs for one SP each for the HQs and the other 10 to rebuild units. The Soviets needed bodies more than HQ SPs, so every combat unit and STAVKA received a 1 SP upgrade. The Germans sat. The HQ could not activate enough blocks with only a 1-hex command radius and OKH could only activate four blocks. The Soviets shuffled six units to create a new line using the STAVKA HQ. The Germans sat again. Same logistics problem. This time, I activated the local HQ and surrounded both panzer blocks siting outside Maikop — knowing each panzer would lose 1 SP. It was cheaper that attacking. Second game. End of German half of Turn 3 [Aug II]. A nice Soviet line remained, along with immobilized Germans. The Soviets would surround the two panzers on their half of the Aug II turn. The Germans built more HQ SPs. The Soviets built up their units and an HQ SP. The Germans scraped enough troops to attack a hex and open up a supply line to the panzers as well as secure a bridgehead next to Maikop. We ended here, with the Soviets unlikely to use their last local HQ SP just to move a unit or two to a better position. After all, we still had the September II turn, although that looked more like another sitting around the campfire turn. The Germans had 30 production points to the Soviets 28 (+2) and had killed 4 blocks (+4) to equal 6 VPs (the other conditions being a wash). That was enough for a German Marginal Victory. We were first quite enthusiastic about the HQ mechanics, but then found everything came to a standstill because we couldn’t build up the HQs enough. Most block games end up stalemates because of a wall of blocks. Here, it was open spaces and no movement. 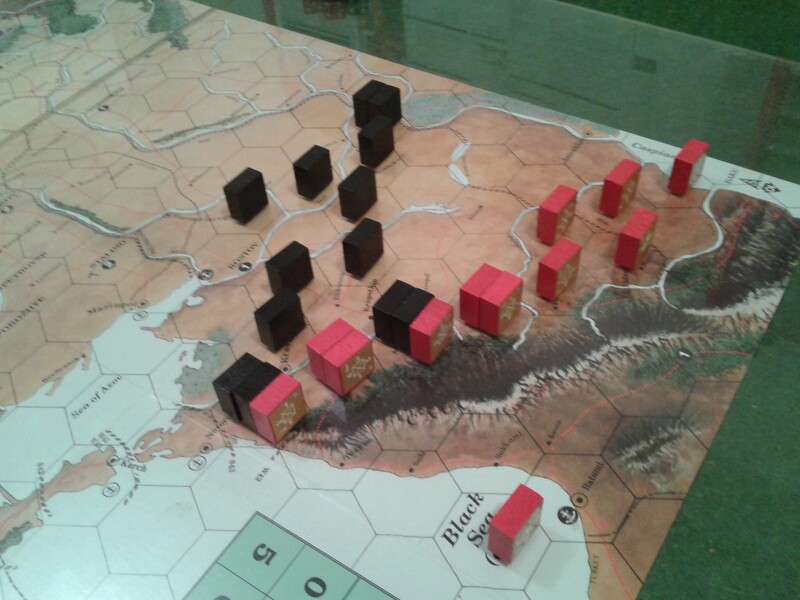 Granted, the Germans didn’t have enough blocks to man a solid line if they had pushed much further, but to be stopped in their tracks by lack of HQ points? True, Dennis could spend points as fast as he got them, but only for one turn’s worth of movement and combat. You can only refill a HQ with 1 SP in the monthly production phase, but East Front has two turns per month, so one of the two turns will be immobile. Then we pondered how to pull off a June 1941 attack. Best guess: Two blitz turns in a row (June II and July I) and then hand-to-mouth SPs for HQs the rest of the game. So it seems like it would mimic the 1941 attack where the Germans surged and then had to stop and not do anything for at least a turn or two sometime in September or early October just to rebuild SPs to at least threaten a blitz attack. The same, presumably, would occur with Soviet attacks later in the war that often just outran their supply lines. That is, after all, historic, and the expensive nature of HQ SPs would indeed cause attacks to stop. It certainly beats trying to slice and dice the supply rules to buy supplies at a specified number of PP per supply and then assign each during the turn to a specific corps so some could move. It’s about 450km, or 280 miles, from Rostov to Stalingrad, or about 50-60 miles per hex on the map. My guess is this represents that even if troops marched unopposed, soldiers need beans, horses need fodder, and so on. We didn’t play in mud weather, which may clog up attacks and so allow for resupply of HQ SPs. We did not try something as simple as being able to refill HQ SPs per production phase (you still have to pay the 10 PP each, but you won’t run out of SP halfway through the month unless you want to). We didn’t try to make the SPs cheaper, either — it’s the single SP rebuild per production phase that is the limitation, not necessarily the PP. As each side only had a dozen blocks, turns took about 15 minutes for each player, so a full turn took a half hour. Any game on the entire Russian Front is going to be a series of compromises. 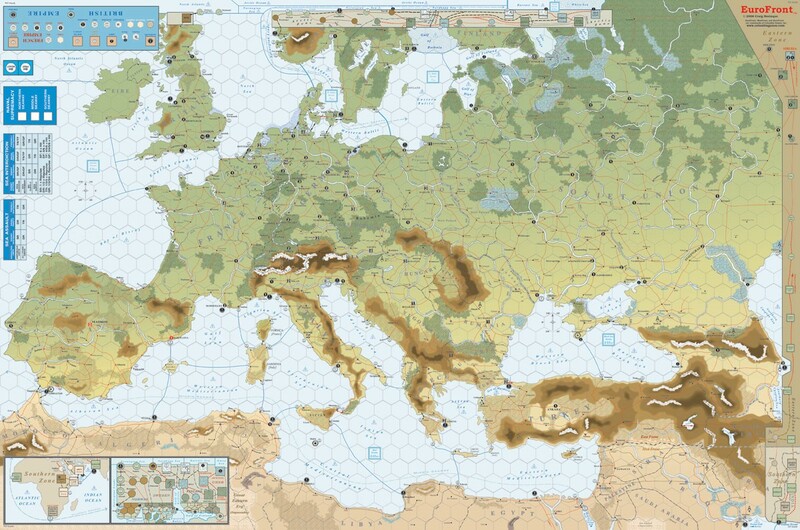 As a veteran of several games of Drang Nach Osten/Unentshieden and Fire in the East/Scorched Earth, as well as one game of War in Europe, tradeoffs are inevitable on the East Front hex map that’s only about 20 hexes or so from Warsaw to Moscow and 30 or so hexes from Leningrad to Grozny. No, this discussion does not include Axis and Allies. HQs are both the strength and weakness of East Front. The HQs offer something different from the usual line of supply in most boardgames, which can throw you off the game. With only two half-games, I just haven’t played it that much to figure out if I hate HQs enough to like ‘em or like ‘em enough to hate ‘em. We like to hear from you! Please leave your thoughts and ideas in the comment section at the very end of this article. Russ Lockwood has been bouncing around the wargaming world for the last 25 years in one capacity or another. Most know him as creator and CEO of MagWeb.com (on-line archive of 162 military history and related magazines from Coalition Web, Inc. from 1996-2009). He appeared on camera on The History Channel (Modern Marvels), ABC, NBC, Fox, and various cable TV shows. MagWeb was also covered by the NY Times, USA Today, and other newspapers, a variety of trade and consumer magazines, and a multitude of on-line sites. He’s given lectures at various HMGS conventions, Origins War College, and various professional meetings and seminars. Although MagWeb closed in 2009, those white MagWeb rulers still appear on wargaming tabletops across the country. On the prior professional front, Lockwood was Editorial Director of AT&T’s web division, Senior Editor at Personal Computing Magazine, Assistant Editor at Creative Computing Magazine, Telecommunications Editor for A+ Magazine (Apple), tech writer at AT&T, Staff Writer (Financial) NY Times Information Service, and freelancer for PC Sources, Windows Sources, PC, MacUser, Byte, Restaurant Business, Hotel Business, Computer Buyer’s Guide and Handbook, and other magazines. He also hosted a radio show, ComputerWise, for five years, and was an on-line editor for ZiffNet on Compuserve and Ziffnet on Prodigy. He is currently a freelance editor and writer covering financial and defense news, with a concentration on the retail industry. If you are really interested, go to Linked In, where he maintains a profile. On the miniatures front, you may have seen his byline in various hobby publications in the 1990s and 2000s. Lockwood is also the author of: Snappy Nappy: Simple, Subtle & Ultrafast Miniature Rules for the Napoleonic Era, and, Hyperspace Hack: Ultrafast Spaceship Fleet Battles with Miniatures (both published in 2009 and available from http://www.onmilitarymatters.com and http://www.caliverbooks.com). Lockwood is also the editor of the Secrets of Wargame Design series, releasing the fifth volume in 2015. Posted in EastFront, World War 2 and tagged Columbia Games, East Front. Eastern Front, Russian Front, World War 2. Bookmark the permalink. I have the full set – East, West and Eurofront – but I just need the opportunity to get it, or at least a part of it, up and running. The declining ability of HQs to fuel offensives seems a trait pretty common to block games. It is very much part of Waterloo 200, and can seem daunting, but it does reward better planning and economy of effort.It clearly means different things in different designs, but the logistical wear of the attack must figure across the board. Thanks for your article. I was a fun and informative read. Labyrinth: The War on Terror 2001-?